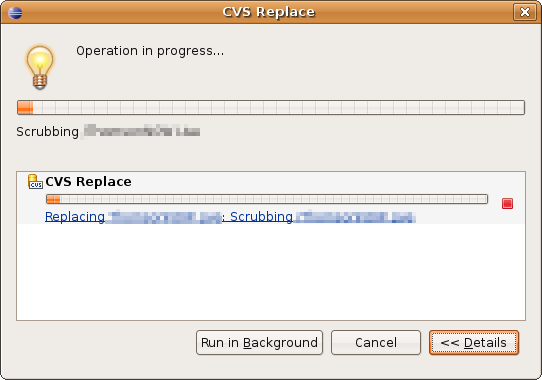 When Eclipse launches into a lengthy operation (being all too often), it shows the all-too-familiar progress window, with an “operation in progress” message, a progress bar, and a line of detail text below the bar. Theoretically, the detail text is simply of the form “[Overall Task]: [Item]” where [Overall Task] could be “copy” and [Item] could be a particular file. So it's a good thing there's a button saying “Details >>” on the lower right, with that lovely chevron inviting the user to expand the dialog and reveal … well, details of some kind about the operation. Hopefully a filename, maybe an individual progress bar for the subtask if we're lucky. But no such luck — the details area merely lists all operations in progress, with the same damn progress bar and detail line. So if there's only one operation going on, all you get is exactly what you already had. “Details >>” indeed. The expanded dialog will include deeper information about what's already in the dialog. The dialog's scope will remain this operation. The dialog's subject is one operation, and unless a control says otherwise, no other operations should be involved. See bug #75968 for more dumb Details button behavior.